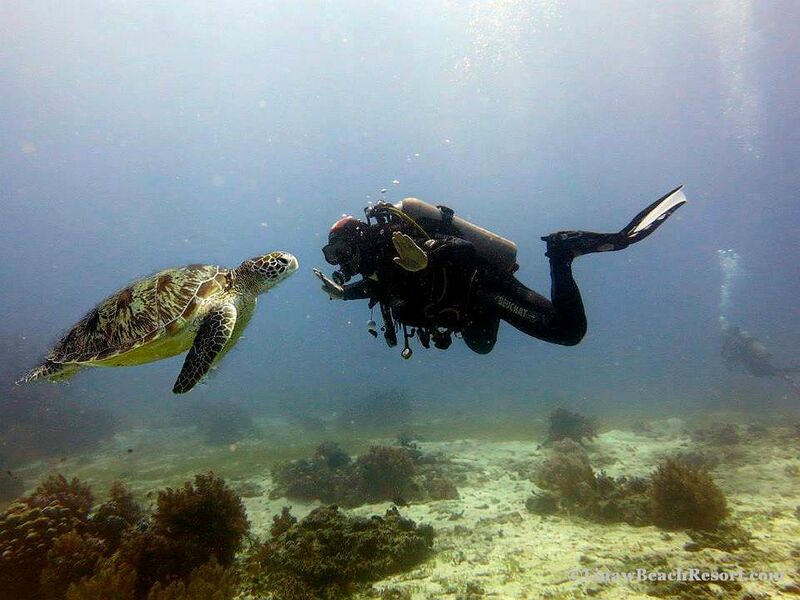 WELCOME TO YOUR NEXT SCUBA DIVING ADVENTURE IN BOHOL PHILIPPINES! 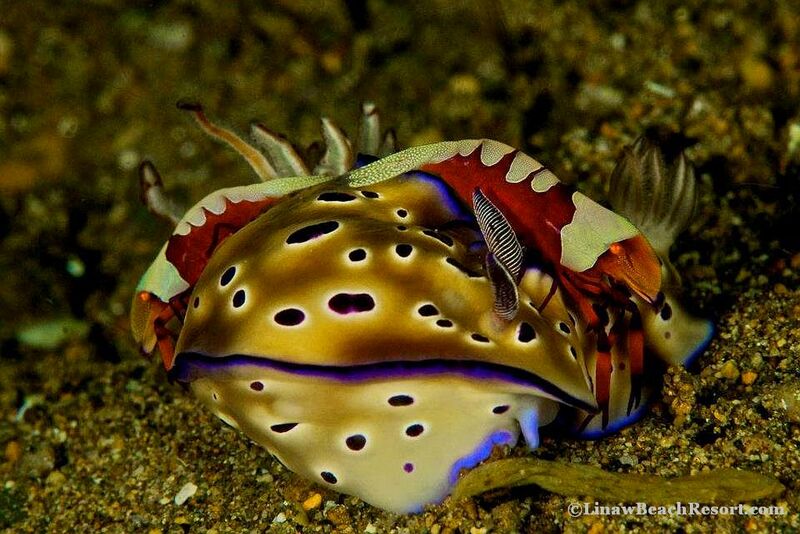 Come discover the world of scuba diving in Bohol, Philippines with Linaw Beach Resort! We are now offering 3 different scuba diving packages in addition to Scuba courses to all our guests. Get to be a certified scuba diver here at Linaw Beach Resort. 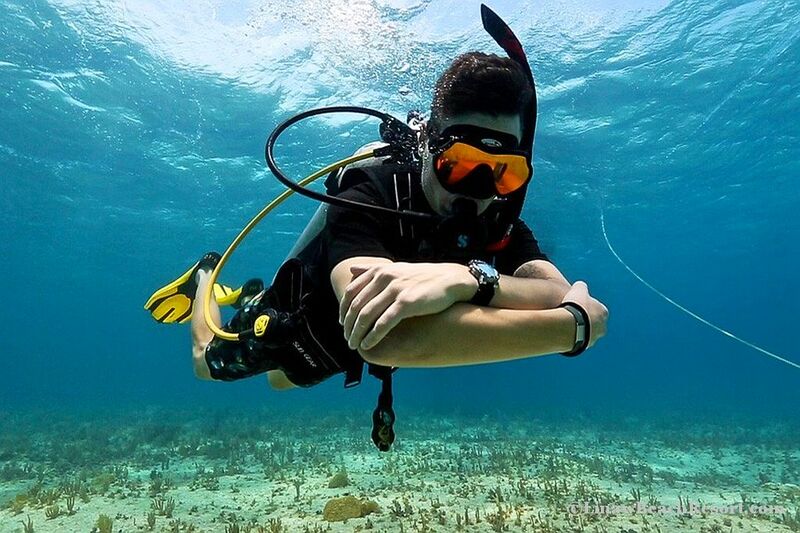 If you’ve already experienced the thrill of exploring the underwater world, but know there’s more to discover. Then choose us for your next scuba diving destination. Whether you’re looking for new dive adventures, to improve your scuba skills, or both at once, booking a All Inclusive Scuba Diving Vacation Package in Bohol will surely leave you breathless when you discover the under the sea beauty we have to offer here. 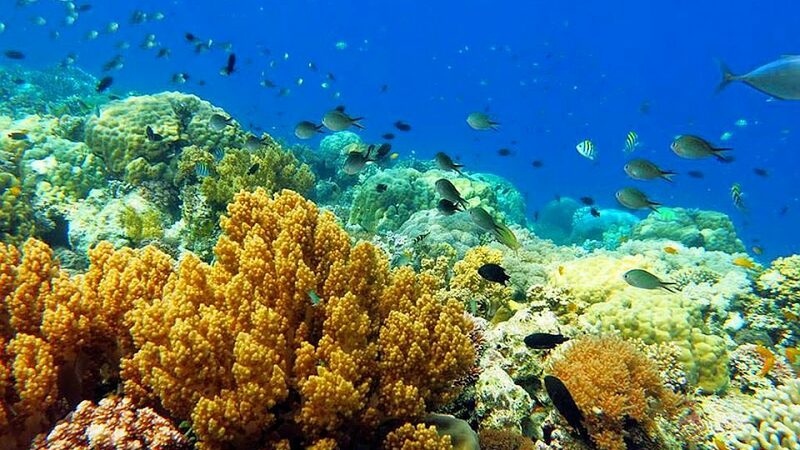 It’s a truly amazing place to dive! Day 1: Arrival in Tagbilaran (Airport or Seaport). Our driver will pick you up and 40 minutes later, you’ll be in your new paradise at «Linaw Beach Resort» Danao Beach, Panglao Island, Bohol, Philippines. Upon arrival, you will receive a welcome drink and check in information to your Superior Room to rest and relax. Your Divemaster/Instructor will meet you in the afternoon at the pool to organize your dives for the following days. Day 2: Today, we will experience the “local” dive sites. Arco, BBC, Kalipayan, PPB, Danao Wall, Kag’Ang. Plenty of them offer rich and various biodiversity. 2 dives in the morning, then relax. In the afternoon, be ready for a sunset dive, different luminosity, different species, we usually finish the dive when the sun is going down. 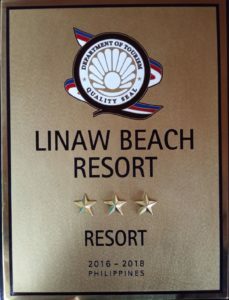 Enjoy your evening and relax at Linaw Beach Resort. Day 3: Let’s go to the island of Balicasag! The most famous dive site in Bohol. After breakfast and a 30 minute boat ride we will dive at Sanctuary, Cathedral, Diver’s Heaven, Black Forest or Royal Garden. 2 dives including a Packed lunch on board. Third dive will be on our way back in Gak’Ang or Puntod for example. (Note: Balicasag is limited to 300 dives per day; we need to register weeks before the trip and only 2 dives/diver/day). We return around 4.30pm, marine fish identification followed by Sunset Happy Hour. Pamper yourself at Linaw’s Pearl Restaurant. Day 4: Last day in Bohol. We highly recommend discovering the “Inland” beauties of Bohol. Our driver will guide you to experience the real Island living and hospitality of our Boholanos. With a stop at the traditional market, discover and taste the tropical fruits. Observe the smallest Primate in the world at the Tarsier Sanctuary. You will meet Antolin once you reach Antequera and he will bring you to a “secret place” in the middle of nowhere, where you can take a refreshing dip in the pure water river, share a typical “pinoy” lunch with your host and just relax and enjoy the « Island feeling ». Last stop to let you witness the amazing scenery of our famous Chocolate Hills. Day 5: Enjoy the infinity pool, a free massage, a visit to the white sandy beaches or any activity you’d love to do before checking out at Linaw Beach Resort. Our driver will bring you back to Tagbilaran airport/seaport. Check out time is 12 noon, but in case your return flight/ferry is late in the afternoon, you can still enjoy a delicious lunch at Pearl Restaurant or pamper yourself before the travel at our Pool area. NOTE: If only booking for 1 person, please add an additional 8.500 Pesos to the Dive package price. Day 1: Arrival in Tagbilaran (Airport or Seaport). Our driver will pick you up and 40 minutes later, you’ll be in your new paradise «Linaw Beach Resort » Danao Beach, Panglao Island, Bohol, Philippines. Your Divemaster/Instructor will meet you in the afternoon around the pool to organize your dives for the following days. 2 dives in the morning, then relax. In the afternoon, be ready for a sunset dive, different luminosity, different species, we usually finish the dive when the sun is going down. Amazing! Day 3: Let’s go to Balicasag Island! The most famous dive site in Bohol. After breakfast, a 30 minute boat ride and let’s dive at Sanctuary, Cathedral, Diver’s Heaven, Black Forest or Royal Garden. 2 dives. Packed lunch on board. Third dive on our way back in Gak’Ang or Puntod for example. (Note: Balicasag is limited to 300 dives per day; we need to register weeks before the trip and only 2 dives/diver/day). Back around 4.30pm, marine fish identification followed by Sunset Happy Hour. Day 4: Pamilacan trip. You will experience fantastic diving at this amazing peaceful Island. We will start early, after our traditional breakfast “by the beach”. First stop will be Snake Island, limited to experienced divers. Dive is just fantastic! Next dive – around Pamilacan Island. After these 2 beautiful dives, lunch on the white sand beach in “Junior and Mesiang” restaurant: grilled fish, chicken adobo, vegetables, sweet bananas… A bit of a rest and let’s go for a third dive. Back in Danao Beach around 4.30pm. Time for Sunset Happy Hour and relax! Day 5: Let’s discover two beautiful dive sites somewhere along the rich shores of Panglao and enjoy the last dives of your trip. 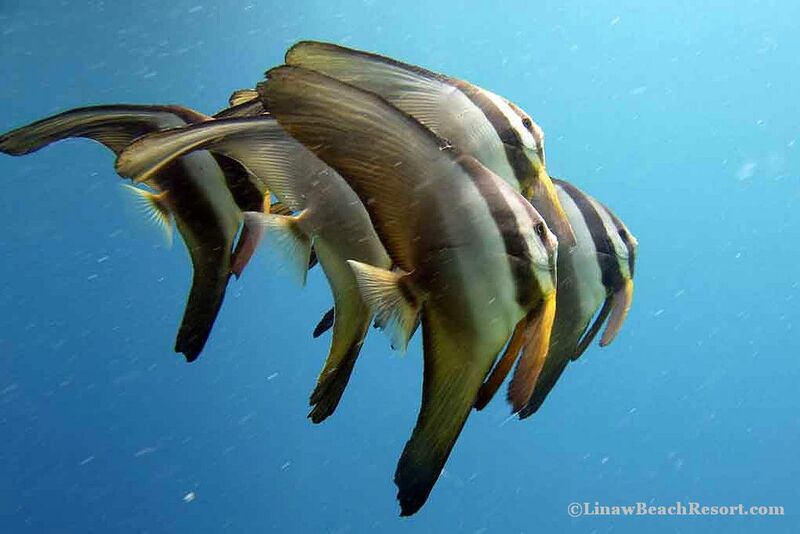 Around 6pm, we will meet for a night dive: just amazing! Day 6: Last day in Bohol. We highly recommend discovering the “Inland” beauties of Bohol. Our driver will guide you to experience the real Island living and hospitality of our Boholanos. Stop in the traditional market, discover and taste the tropical fruits. Observe the smallest Primate in the world at the Tarsier Sanctuary. You will meet Antolin once you reach Antequera and he will bring you to a “secret place” in the middle of nowhere, where you can take a refreshing dip in the pure river, share a typical “pinoy” lunch with your host and just relax and enjoy the « Island feeling ». Last stop to let you witness the amazing scenery of our famous Chocolate Hills. Day 7: Enjoy the infinity pool, a free massage, a visit to the white sandy beaches or any activity you’d love to do before checking out at Linaw Beach Resort. NOTE: If only booking for 1 person, please add an additional 11.500 Pesos to the Dive package price. Day 1: arrival in Tagbilaran (Airport or Seaport). Our driver will pick you up and 40 minutes later, you’ll be in your new paradise « Linaw Beach Resort » Danao Beach, Panglao Island, Bohol, Philippines. Day 3: let’s go to Balicasag! The most famous dive site in Bohol. After breakfast, a 30 minute boat ride and let’s dive at Sanctuary, Cathedral, Diver’s Heaven, Black Forest or Royal Garden. 2 dives. Packed lunch on board. Third dive on our way back in Gak’Ang or Puntod for example. (Note: Balicasag is limited to 300 dives per day; we need to register weeks before the trip and only 2 dives/diver/day). Day 4: Eco-Tour Antequera. Our driver will guide you to experience the real Island living and hospitality of our Boholanos. Stop in the traditional market, discover and taste the tropical fruits. Observe the smallest Primate in the world at the Tarsier Sanctuary. You will meet Antolin once you reach Antequera and he will bring you to a “secret place” in the middle of nowhere, where you can take a refreshing dip in the pure river, share a typical “pinoy” lunch with your host and just relax and enjoy the « Island feeling ». Day 5: Pamilacan trip. You will experience fantastic diving at this amazing peaceful Island. Next dive, around Pamilacan Island. After these 2 beautiful dives, lunch on the white sand beach in “Junior and Mesiang” restaurant: grilled fish, chicken adobo, vegetables, sweet bananas… A bit of a rest and let’s go for a third dive. Day 6: have fun and a little bit of action while exploring the shorelines of Panglao. Kayak trip from Alona Beach to Bee Farm. Day 7: let’s discover two beautiful dive sites somewhere along the rich shores of Panglao. Day 8: second Eco-Tour. You will be guided inland of Bohol, known as the « Friendly Heart of the Visayas » and one of the most attractive tourist destinations in the Philippines. We go up to see the famous Chocolate Hills where we meet our local Guide Nordelyn. You can taste a Pilipino lunch in the middle of nowhere, prepared by the family of Nordelyn. On the top of one of the Hills you can experience an amazing 360* panorama. On the way back, passing the rice fields you may try riding a buffalo. Try a fresh « Buko » before heading home. Day 9: free day. Enjoy the infinity pool, a free massage, a visit to the white sandy beaches or any activity you’d love to do. 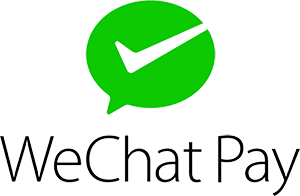 Day 10: check out. Our driver will bring you back to Tagbilaran airport/seaport. Check out time is 12 noon, but in case your return flight/ferry is late in the afternoon, you can still enjoy a delicious lunch at Pearl Restaurant or pamper yourself before the travel at our Pool area. NOTE: If only booking for 1 person, please add an additional 16.350 Pesos to the Dive package price.